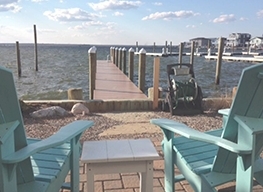 Ocean Breezes is a recently renovated beach house located just 1 off ocean front, with access to one of the widest stretches of beach on LBI. The home has everything you would look for in a beach house and more! From the multiple exterior seating areas, to the comfortable soothing interior, the home will bring you joy even on those rainy days that you keep you inside! Conveniently located near the causeway, this property is within walking distance to great shopping and dining spots for the entire family. Its convenient location offers a short walk to cafes restaurants, a liquor store, pizza shops, and much more. The latest renovation offers a New Kitchen and a newly renovated downstairs. The home includes beds for 12 persons (with two more people permitted in sleeping or air mattresses for a maximum of 14 persons as sleep over guests). This beautiful vacation home includes a king bedroom with new furniture, two queen bedrooms, 1 bedroom with 2 twin beds, and a new sectional in the living room, plus a large, professionally-designed guest bathroom on the second floor with a double vanity and custom tiled shower, and a NEW FLAT SCREEN TV!! Also, new to the home is an extra large capacity front loading washer dryer for your convenience, and parking for 3-4 cars. The home has all the comforts your family needs to enjoy their vacation, including a large living area on the first floor and plenty of comfortable outdoor seating. There is a front seating arrangement on a wooden deck along with a rear deck with dining table and gas grill. The new Master Ensuite on the upper level offers a queen bed, flat screen TV, DVD player, CD stereo system, wet bar, and full bathroom. Relax on the exterior deck looking out to the ocean. Great ocean breezes can be found here! The home is set up with beach tags, beach chairs and umbrellas. This home has been renovated by Louis Shaw Designs affiliated with Style Vacation Homes by Louis Shaw for the past 6 years. Louis Shaw Designs concept is to design forward and this home now offers contemporary accents and colors to emotionally soothe and stimulate, bringing our guests into a peaceful vacation state of mind. The owner has been upgrading this home to create a more up-to date vacation home for her guests. The unique character of this home is traditional to Long Beach Island. The wooden exterior and wood interior beams lends itself to the beach surroundings. This house is truly a home! The homeowner has ALL the accommodations......cleanliness, provisions and location .... just perfect. Our week in LBI was enjoyed by us, our furry-footed pets and our lifelong friends. The views are spectacular and the fenced in yard is a huge plus. Many thanks to you and your impeccable cleaning staff! Thank you for taking the time to leave your thoughts! We love being just 2 homes from the beach with fantastic views AND within walking distance to shops and restaurants! Our four footed family members enjoy their time in the beach house too! The home is fully stocked and furnished to give the feeling of beach vacation with style! We hope to have you stay with us again. This home was beautiful! Perfect location—one house away from the beach, with gorgeous ocean views, close to restaurants/shops, and very spacious. The towel delivery service is a great treat too. Our family had a great vacation and would highly recommend staying in this beautiful home. This home was perfect! We are quite particular, and the house was immaculate, and very well appointed. The upper deck was perfect for taking in the view and totally relaxing! We highly recommend this home. Thank you for taking the time to leave a review! They help future guests decide if our home is a good fit for them. In the off season we continue to do upgrades on our home as we strive to provide a five star stay for all of our guests. We are pleased to hear that you appreciated how "immaculate" the home was as well as how tastefully decorated and well stocked our home is. We are happy to share those great views and relaxing moments for our deck! The home is also within easy walking distance to shops and restaurants for the full Shipbottom experience! We hope to have you as our guests in your future travels! Had a wonderful time in LBI. The house was clean, fully stocked with supplies and linens and located right at the beach entrance. The back yard was fenced in and was safe for our boxer, had a new Weber grill, new lounge chairs and big outdoor shower. The third floor was perfect for our teenage daughter and friends to hang out and relax. Our family had an amazing time! Thanks for letting us spend the week at your amazing beach house!! Beautiful and spacious with a perfect location! We loved this place and it was great for our group! The appliances and grill were basically brand new and the outdoor shower was amazing! It is so close to the beach and many stores! I would absolutely stay again! Hi Courtney, Thank you for taking the time to post your comments. We are huge fans of this home. The owner does everything she can to assure her guests are comfortable and have an enjoyable experience. Stepping outside the door and being steps from the beach, makes this home the perfect beach house! Thank you again for your comments. We celebrated our 30th wedding anniversary here with family and loved every minute of it, and yes, family meant dog too. All the amenities of home are provided and we lacked nothing. The beds were comfortable, the house nicely furnished and in good condition. The verandas were lovely and gave everyone a little nook to have some time out in. The outside shower was clean and comfortable as well as the outside main patio. Cooking was made easy as the kitchen was very well supplied. If there was one complaint it was that we did not want to leave. Thank you for a wonderful anniversary celebration! Great week at the beach! First time in this house and loved it! We normally stay in Beach Haven Gardens, however we wanted to take the dogs this year so we rented this house because it was pet friendly. We weren't sure about staying in Ship Bottom but the location worked out really well and we loved being so close to the beach. The house was great and had all the amenities plus more. It was very clean and it was so nice not to have to bring bed linens and towels. It was a really nice week and we would definitely go back!!! !